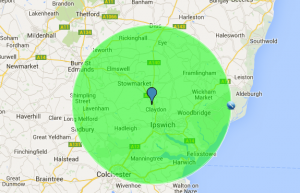 We are based in Great Blakenham, Ipswich and cover around a 30 miles radius. We offer an out-of-hours, weekend, as well as night service, giving our customers 24/7 coverage, making us first for flexibility and service. Our concrete technicians can provide you with free advice and quotations. We pride ourselves on customer service and will always try our best to fulfil your concrete needs.